The King is a hamburger joint near Hongkik University in Jochiwon. Not to be confused with Burger King, The King makes all their burgers by hand. As a result, you may have to wait a while for your order to be ready (likely 20-30 minutes), but it’s well worth the wait. Bigger groups will usually have a longer wait. Groups of 4 or 5 are best for visiting this wannabe hole-in-the-wall. We recommend a group of less than 10 people, as more than 10 would nearly fill the entire seating area. There is also some outdoor seating in warmer weather. The King looks dark from the outside, but don’t let that fool you into thinking it’s closed. The lighting inside is mellow and the minimalist interior design coupled with modern furniture give it the feel of a trendy college hotspot (which technically it is, given that is right around the corner from Hongik University). The burgers here are hearty and eating them reminds us of that old Carls’ Jr. slogan: “If it doesn’t get all over the place, it doesn’t belong in your face.” You will need some skill to keep all the toppings from sliding out of this over-sized burger, which fits better into your mouth when cut in half. It’s important to note that the burgers here are cooked on the well-done side. So if you prefer a more medium or medium-rare burger you will need to request that when you order, since they don’t usually ask. The King is the basic hamburger and comes with lettuce, tomato, and their special sauce, a delicious mix of mayonnaise, mustard, and legit BBQ sauce. Other variations build onto the basic burger: the Mushroom (adds mushrooms) , the Bacon (adds bacon and cheese), the Premium (adds an extra patty and cheese) and the Garlic Hash (adds garlic and french fries). 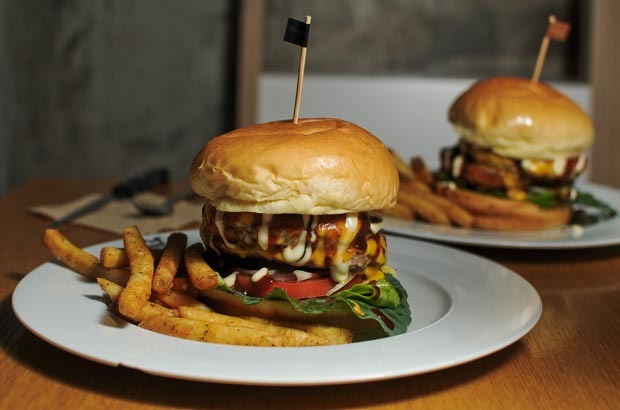 Our top recommendation is the Bacon Burger Set which includes fries and a drink for an extra 2,7000₩. If you come with a big group, you might forgo the set and order a basket of fries to share instead. 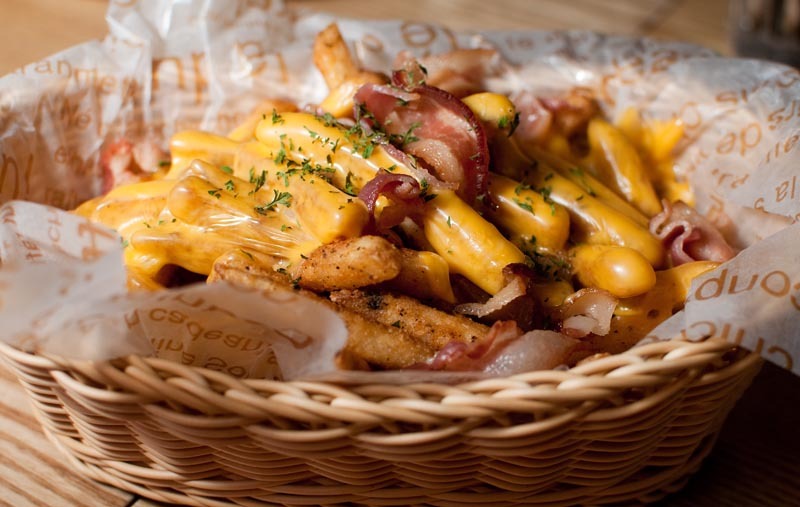 The fries are well seasoned and crispy and the basket is topped with cheese and bacon. You can never go wrong with bacon! That is, unless you’re vegetarian, in which case we don’t recommend you visit, as there aren’t really any vegetarian options. There is one salad on the menu: a ‘Wedge Potato N Tender Salad,’ although that is better ordered as a side to be shared at the table rather than a main dish. 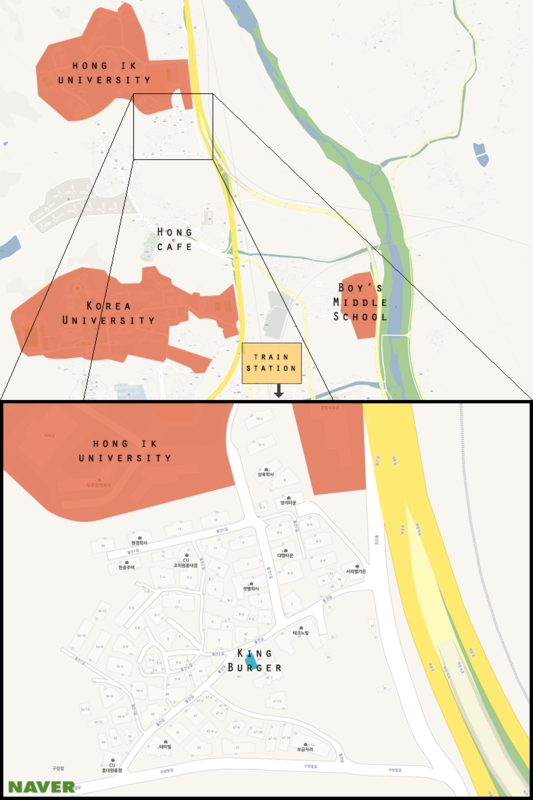 Directions: Walk or take a taxi to Hong Cafe. From Hong Cafe walk up the street towards the university a few blocks. Turn right at the first GS25 (there will be a big tree on your left). Go straight, past Africa Chicken and take the first left. The King will be on your right, past Buy the Way convenience store.